Black Beauty Congratulations, wishing you many new adventures. An extra set of rear lights and a brolly tube - get you, very nice indeed and Richard is a nice guy to deal with. The perspex sun visors are also very nicely done. And what looks like cut down front over-riders with spotlamps. I hummed and harred about stainless vs alloys, think the alloys look superb on the black car. 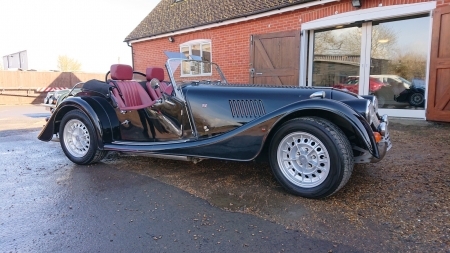 if this is the car I saw in Richard Thorne's the other week, it is a fine car, and very well looked after by the previous owner. Very similar registration to my mog. Lovely car. +2. That is one lovely looking car! Agreed red and black are a classic combination.